as an activity accompanying the exhibition Artists as Catalysts. The rapidly decreasing cost and widespread adoption of 3D printers has been aided and accompanied by new software applications that make 3D modeling simpler for everyday people. This workshop is an introduction to 3D modeling and 3D printing for families and educators. Participants will learn the use of several free 3D modeling applications (including the Autodesk 123D suite, TinkerCAD, Sculptris, and Skanect) — as well as the use of the Makerbot Replicator, an inexpensive 3D printer widely used in schools and hackerspaces. The workshop will also present the many different ways in which people around the world are using 3D printing to create useful, expressive, and critical objects. This workshop is designed for 8-12 participants. The recommended format is: one workshop leader, one technical assistant, 8-12 participants (or participating families), in a room with a video projection, worktables and comfortable chairs, and readily available WiFi and electric power. The workshop may last as little as 3 hours, or (for more advanced participants) two days. This workshop is suitable for families. It is recommended that kids should be older than 7 or 8 years, and have basic skills in reading and computer-mousing. Participants are expected to bring their own laptops and (if possible) an iPhone or iPad. Makerbot Makerware. Converts STL CAD models into printfiles for Makerbots. TinkerCAD. Simple 3D modeling in the browser, produces downloadable STL files. 3DTin. Simple 3D modeling in the browser, even more lightweight. Sculptris. Freeform modeling in a clay-like process. Blender. Powerful free modeling software. Sketchup. Quick and easy modeling, especially of architectural forms. Huge 3D library. 123D Design. Easy yet powerful modeler for 3D printing (desktop & browser). Leopoly. Easy freeform modeling, good for the kids. Netfabb. Repairs STL models with errors (for example, if they’re not “watertight”). MeshLab. For previewing STL models, and some kinds of editing/repair. Kinect to STL. 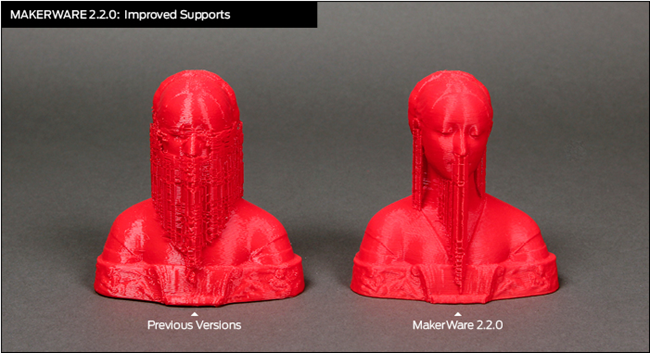 Captures a 3D portrait with a Kinect, ready-to-print. OpenSCAD. A programming language for creating 3D objects. 123D Creature. Manipulate an underlying “skeleton” in order to design a 3D printable creature. 123D Catch. Use your camera to capture the things around you as sharable, printable 3D models. 123D Sculpt. General sculpture for the iPad. Example: my NeoLucida store on Shapeways sells my eyepiece designs. There are now many kinds of 3D printers. They build up objects additively. They cost from $500 to more than $500,000. The Makerbots we’re using today cost about $2000. Machines like Makerbot, Ultimaker, RepRap, Cubify print plastic (generally ABS or biodegradable PLA) in a process called FDM (fused deposition modeling) or FFF (fused filament fabrication). Formlabs and Objet Connex printers, among others, use cured liquid plastic, with a much higher resolution, in a process called SLA (stereolithography). Other machines can melt metal and ceramic powders, in a process called SLS (selective laser sintering) or SLM (selective laser melting). Access to 3D Printing Equipment. Where do 3D models come from? Some other ways of making things. And good old machine tools and hand tools! What do people do with 3D printing? Is 3D printing just for toys and useless knick-knacks? At first blush, it could seem that way. People make art, architecture and design, often experimental. 3D printing can be used to help people overcome medical needs and disabilities. 3D printed exoskeleton lets Emma, a little girl with arthrogryposis, raise her arms. Beauty, a bald eagle given a 3D printed beak. Buttercup, a duck given a 3D printed foot. 3D printing is also becoming controversial, and has some dangerous implications. Various artists are now using 3D printing to create “critical objects”. These objects offer a critical perspective on privacy, politics, consumer culture, and commercial media. Using 3DTin, make a flat “medallion” of your initial. Export an STL and print it out. Using Sculptris make a character or animal figurine. Export the model as an OBJ file. Convert the OBJ to an STL using Meshlab or the Autodesk 3D Print Utility, and print it out. Make an account on Thingiverse and share your figurine. These are suitable for a second session with adults, but may be outside the scope of a workshop for children. We will use Tinkercad to modify objects made by others. Download an STL file from Thingiverse (or paste its URL into TinkerCad); using TinkerCad, customize or personalize it. Note that there is a 25MB limitation to the size of uploaded files. Download two STL files from Thingiverse; using TinkerCad, stick them together to create a mashup. Add a holder for iPhone, coffee cup, pens, etc. Look around and solve a problem with a simple design. Consider the “useful items” listed above. Fix something broken that you bring from home. Use OpenSCAD, or Processing and the ToxicLibs library, to generate a parametric STL file. Undercuts and support material. Printers like the Makerbot can’t easily print objects with undercuts (e.g. like a standing ‘T’) because there’s nothing to support the upper material. Fancier printers use a dissolvable support material. FDM/FFF machines like the Makerbot can, however, print a lightweight scaffolding that can easily be snipped off. Print orientation. The orientation with which something is printed can make a big difference for how much support material must be printed. Consider the difference between printing T and ⊥. Furthermore, the print orientation can also affect how the part behaves under physical stress. Infill. 3D printing a lot of material can get expensive, whether because of the cost of the material itself, or because of the time necessary to print it. 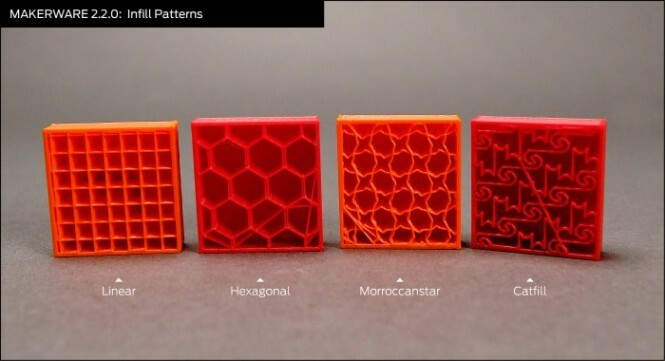 Makerware solves this by allowing you to specify the density of an interior honeycomb.